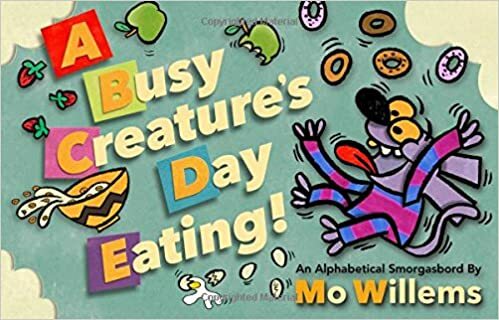 A BUSY CREATURE’S DAY EATING is a fast favorite for the kids and grownups in my family. Mo Willems has created an alphabet book that has a complete story arc from first bite to bedtime. The reader follows a sweet little creature as it eats through the alphabet. The creature also suffers the repercussions of eating everything and anything. This alphabet book is anything but bland so I created an alphabet art activity accompany it. Cut the slightly smaller paper into letters for each child. Affix letters to the larger paper using a roll of tape on the back. Create paintballs by pouring paint into coffee filters and closing them with rubber bands. Then move the chairs away, step back, and start dropping paintballs on the letters below. The coffee filters create an interesting texture by allowing a little paint to seep through. When the letters and backing paper are covered in paint remove the letter from the backing. It will reveal another copy of the child’s letter created with whitespace. Ta da!